itch.io is an exciting new service that aspires to be “a simple way to find, download and distribute indie games online.” By offering different options for developers to sell their projects, or even just host them with an integrated donation button connected to other services like PayPal and Amazon Payments, it stands apart from many other storefronts and services by being free to register and use. No up-front costs or credit card needed. Just file hosting and a support system to help indie games gain exposure and receive support. 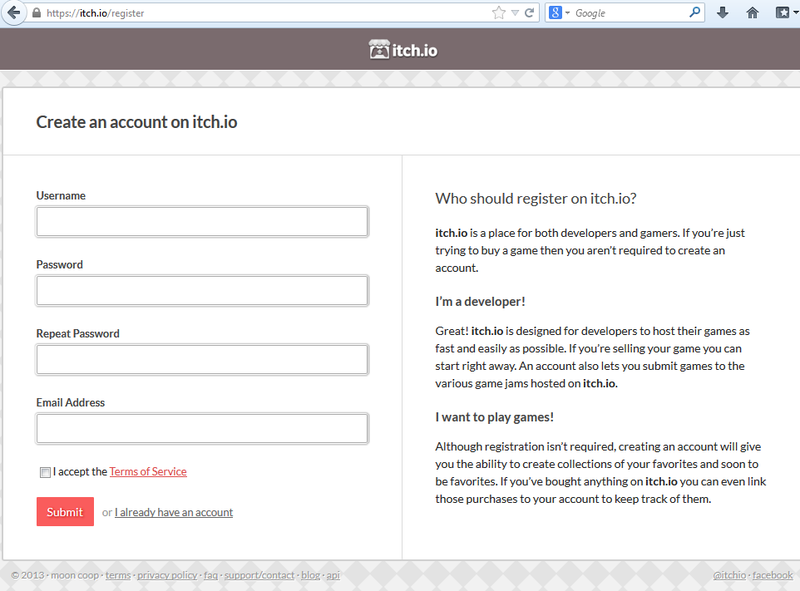 To start using itch.io yourself, you need to visit their Register page. 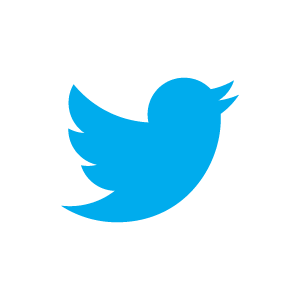 Create a username, a password, and fill in your e-mail address. Be sure to read the Terms of Service and then, if you agree, accept those terms. Once you have an account, you can login with your credentials to get access to the “My Games” section of the site. Click on the “Create new game” button. For this new hosted game, you can pick the title and the game URL. 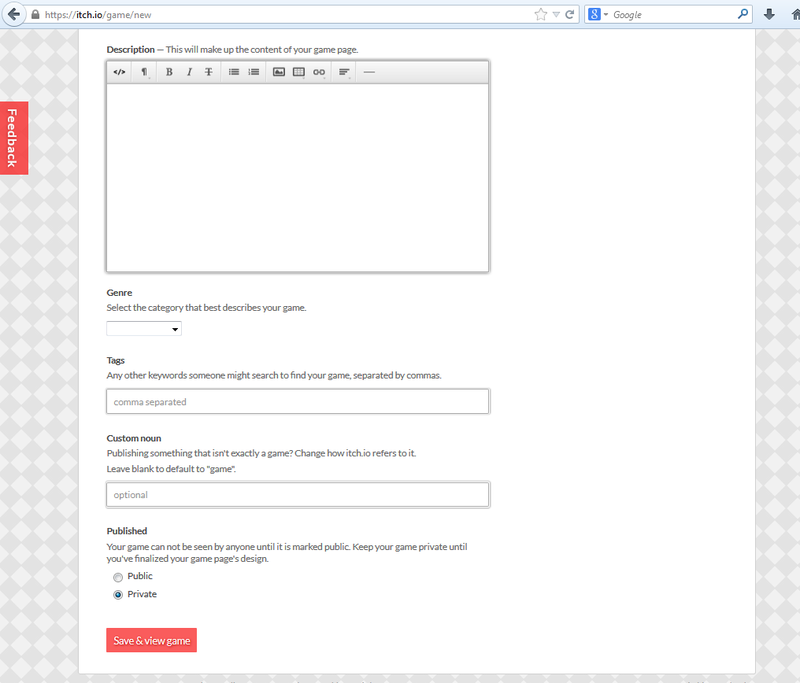 You can also upload a cover image, add screenshots, and include a short description or tagline for the game. 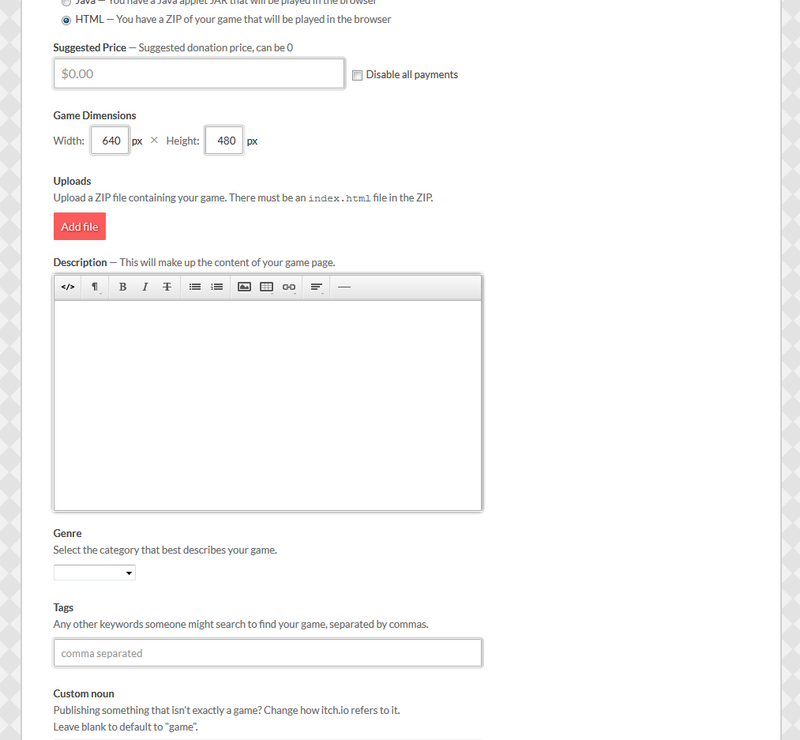 Since this guide is aimed at Twine users, you will want to select HTML under the “Kind of game” options. For the “Suggested Price” field, you can enter the lowest suggested donation amount or, if you prefer, click on the “Disable all payments” check-box instead. If you selected HTML from the “Kind of Game” options, you can set the Game Dimensions here. Once you get down to the Uploads section, you will need to prepare your Twine file for uploading. Once you have a “index.html” file, you will need to create a ZIP file next. 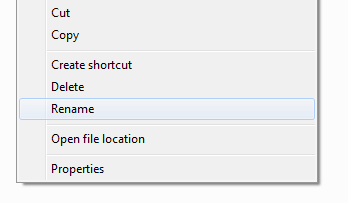 In newer versions of Windows, this can be done by right-clicking on the file, selecting “Send to” and clicking on “Compressed (zipped) folder” to create a new ZIP file. Once created, click on the “Upload” button from the itch.io site. Click on the “browse” button and find the newly created ZIP file from the file window. Click “Submit” to upload that file. Once you have your ZIP file uploaded, you can write a description of the project and select its associated genre. You can also include comma separated tags for how someone might search for your game. As the second to last step, you can choose what noun you would prefer your project be called. If you don’t like “game,” or you think another word might be better, itch.io lets you include that here. Finally, once you have everything set, make sure it is set to Private and then click on the “Save & view game” button to test. Privately viewing a game hosted on itch.io gives you the chance to do some final testing before making your game public. ‘Playing’ through it using this setting will give you a feel for how others might see in their own browsers. You can see if the dimensions are to your liking and if they show enough of the game. You can also read through the description one more time too. If you would prefer to get some outside opinions, you can even use the “Private share URL” at the top to see the location of this private viewing and share the link with others. Once you are done testing, or if you would like to edit something about the game, clicking on “Edit game” at the top will take you back to the previous page and allow you to edit the game entry to your liking. If you want to sell or support your Twines game on itch.io, you need to set up the payment information before making your game public. 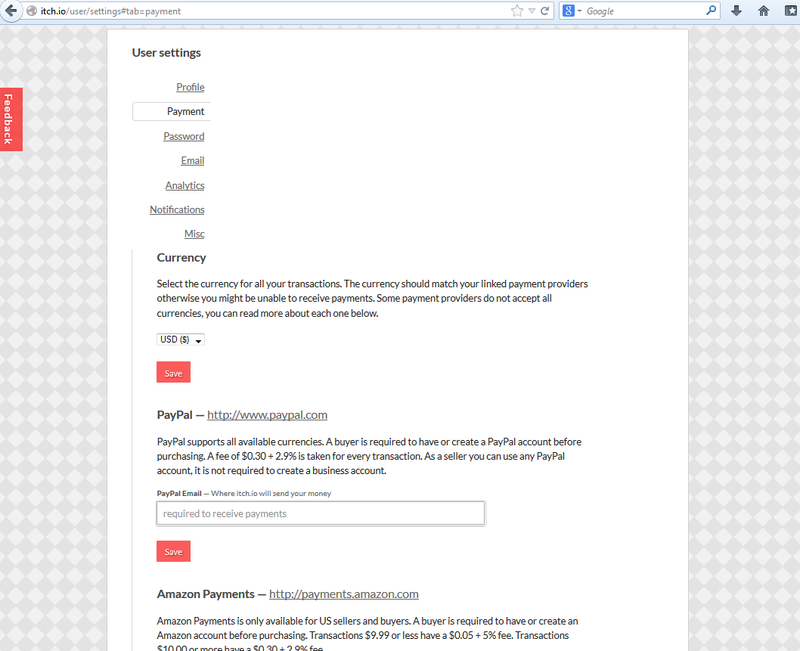 Visit the Payment tab under user settings. 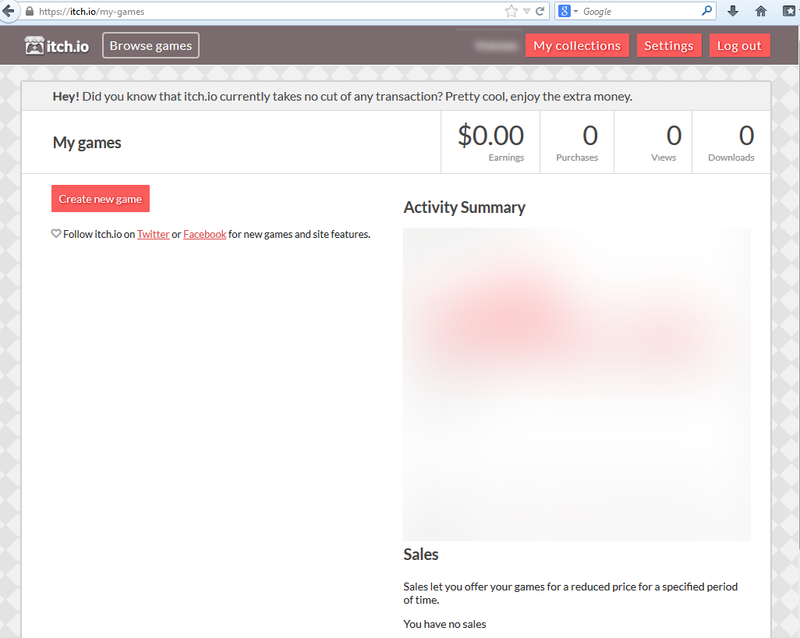 You can also change the currency itch.io uses for your transactions too. Once you have edited your game entry to your liking, tested it under the private view, and linked or supplied your payment information (if you wanted to do that), it is time to make your game public. Under the game’s entry, scroll to the very bottom and click on the “Public” option. Now, click on the “Save” button. 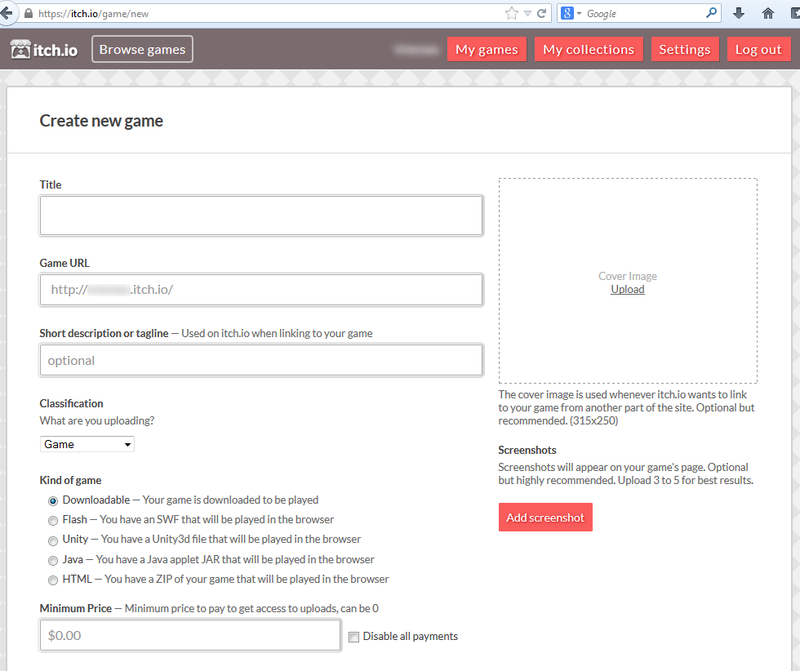 Itch.io will create an official URL for your game based on what your supplied in the game entry. Be sure to visit your game right after making it public too. 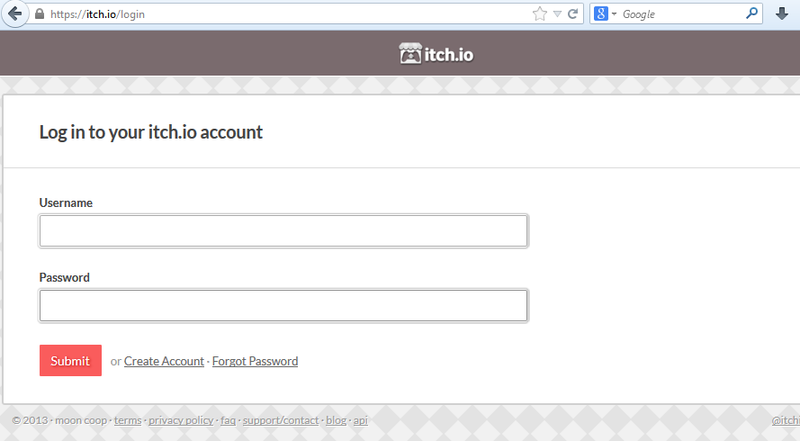 Itch.io does not load it until someone (you, in this instance) visits the public game at least once. Congratulations! 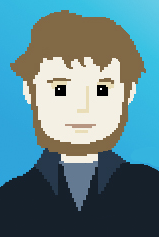 Other people can now play your game on itch.io!